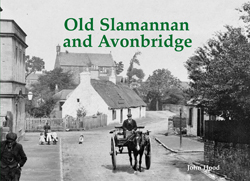 Slamannnan and Avonbridge owe their development to the growth of the mining industry and by the 1880s 2,000 men and boys were working in the local pits. The mines have long gone, but its heyday can be relived with this book which also features Limerigg and Standburn. Former local studies librarian John Hood has written long informative captions to accompany the images which are typical of mining villages with gala days, the co-op, shops and local characters.